Is Poker Skill or Luck? 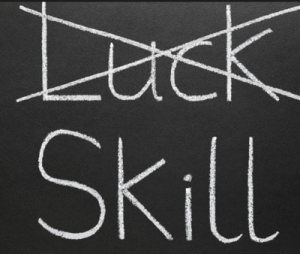 Home/Online Poker/Strategy/For Beginners/Is Poker Skill or Luck? This question ” Is Poker Skrill or Luck ” is at the epicenter of a long debate about online poker. If poker is luck, then it will fall under the gambling laws. If poker is a game of skill, then such casino laws cannot regulate the game. It seems that there are strong proponents for each view, creating a lively discussion on the Internet. This can have serious consequences as some people and companies may have to pay big fines if convicted of breaking gambling laws. Such legal issues depend on the state or country laws and definitions of gaming and gambling so that there may never be a universal answer. Another salient comment comes from a blog post by silentarchimedes who argues that there are a lot of similarities between poker and stock investing. In economics, speculation is the villain and investing the hero. Speculation is associated with gambling and is considered to be a non-productive activity, sometimes even harmful to the economy. Whereas investing is a noble endeavor requiring skill and intelligence and serving a higher purpose, i.e. better capital allocation into the economy. But how much gambling and how much skill is there for the average Joe when it comes to stock investing? The financial events of 2008 demonstrate that there was a tremendous amount of gambling involved in stock investing in recent years. Similarly to poker, stock investing involves both luck and skill. Another simple argument is to observe that there are thousands of professional poker players. It is true that most are young and cannot attest of the long-term viability of poker as their only source of income. But take someone like Doyle Brunson who has been living off poker exclusively for the past five decades. Was he lucky fifty years in a row? Another argument was developed by a Dutch Professor of Statistics who created a scale to rank games depending on how much luck or skill is involved in every specific game. His formula is skill = learning effect / (learning effect + chance effect), where learning effect is the difference between an optimum player and a beginner. Based on this scale from zero to one, poker scores 0.4 and ranks at the same level as chess. And by the way, have you ever met a professional roulette player? The question of ” Is poker Skill or Luck ” could add or withdraw billions of dollars in revenue to the online gambling industry because games of skill are considered legal by US laws, whereas gambling is prohibited. More importantly it could jeopardize the hobby of millions of American players. If you have not yet done so, join the Poker Players Alliance, which represents all poker players. It lobbies Congress intensely to pass the message that poker depends mostly on skill. If you play poker, please join this organization that fights for our rights. Three recent court decisions may have a profound effect on the skill luck debate. And by the way it does not matter if this is Fixed Limit Hold’em, No Limit Hold’em, Pot Limit Omaha or Stud, all these poker variations are very similar as far as the skill and luck balance is concerned. A lot has been talked about a ruling in Pennsylvania that determined that poker is a game of skill by deciding over gambling charges against a home poker room. The judge used 4 criteria to dismiss the charges: if data is available to make an informed choice; if players can exercise skill in the game; if skill sufficiently governs the outcome; and if the players understand how skill affects the outcome. This is the first case where the judge looked at recent studies and arguments such as the ones mentioned in the previous section. And this is the first case where Texas Hold’em is considered a game where skill predominates over chance. Therefore it is not considered “gambling” under Pennsylvania law (and many other States as well). The second ruling happened in Kentucky where the Court of Appeals rejected the State’s attempted closure of 141 Internet domain names. Many of them were poker portals. This decision has been appealed to the State Supreme Court. A third ruling is debated in February 2009 in South Carolina, but the Judge Larry Duffy has already declared that he had determined that Texas Hold’em was a game of skill. A strong argument was made by famous poker player and WPT commentator Mike Sexton who was brought to testify by the Poker Players Alliance. Another important development is of course the election of President Barack Obama, himself a poker player. He has ordered to freeze all last minute laws from the Bush Administration, including the ratification of the infamous UIGEA. For reference, we discuss the UIGEA in more details in our article about poker legality. It seems that the scale of justice is starting to tilt in the right direction. Of course Texas Hold’em Poker is a game of skill. Online poker has been such a success because it is a perfect blend between skill and luck. If it were too much skill, it would be like chess and there would be no fish who think they are good, although they are lucky instead. If it were too much luck, it would be more like roulette with no professional players. If you are new to poker and not certain that it is a game of skill, it is perfectly normal. This is exactly the type of question you should ask yourself. The best way to know the answer is to play and study poker.